Peeling tomatoes is a pretty simple process. First, you need a large pan full of water. While the water comes to a boil, get your tomatoes ready. Wash them and cut out the core and the blossom end. With a knife, slash an X in the top and bottom of each tomato. Doing this will help the skin come away from the flesh of the tomato. Run some cold water into a large basin or sink. When the water is boiling, lower 3 or 4 tomatoes into it. Leave in for 1 minutes. Quickly remove and put into the cold water. The cold water will stop the tomatoes from cooking. Repeat with the remaining tomatoes. 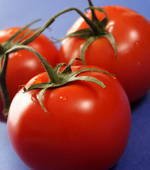 Many of the tomatoes will have skin that looks like it is already peeling away and that is good. After letting the tomatoes cool for a few minutes, you can start peeling the tomatoes. With a knife, peel the loosened skin away from the tomato.